+ Pearl A Culpepper, 24 Dec 1876 – 24 Dec 1968. Cecil Culpepper, Son, M, 17, Sng, GA/GA/GA, Industrial Farmer. Cecil W. Culpepper, Brother, M, 27, S, GA/GA/GA. Pearl A. Culpepper, d. 24 Dec 1968 at 92 years in Worth Co., GA; Res. in Worth Co., GA.
Ralph L. Culpepper, d. 30 Jan 1988 at 88 years in Dougherty Co., GA; Res. in Worth Co., GA.
Cecil W. Culpepper, d. 25 Sep 1992 at 89 years in Dougherty Co., GA; Res. in Worth Co., GA, 038694. + Eula Pearl Culpepper Spradlin, 21 May 1905 – 31 Aug 1964. Obituary* 4 Dec 1950� Jesse C. CULPEPPER, 81, a retired watchmaker, died yesterday at 10:20 a.m. at his home, 4404 Beallwood avenue, following a long illness. Mr. CULPEPPER was employed as a watchmaker at Fort Benning until his retirement in 1941. He had lived in Columbus since 1928 and was a member of the Baptist church. Born in Lee County, Ala., March 26, 1869 [sic - grave marker shows 25 MAR 1869], Mr. CULPEPPER was a son of the late Jefferson and Mary Elizabeth HOWARD CULPEPPER. Surviving are his widow, Mrs. Lexie CULPEPPER, Columbus; four daughters, Mrs. Wayne HOLLANDER and Mrs. D. P. WADE, Pine Mountain Valley, and Mrs. J. 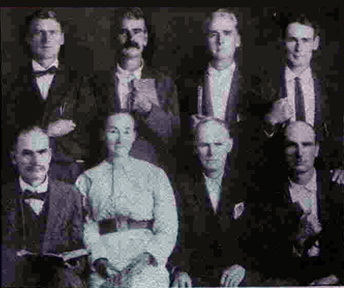 B. BATASTINI and Mrs. Milford TUCKER, Columbus; two sons, R. L. CULPEPPER, Tampa, Fla., and Mr. W. P. CULPEPPER, Columbus and several grandchildren. Funeral was to be held at 4 p.m. at the Striffler mortuary chapel. The Rev. Charles W. DRAKE, pastor of the Beallwood Baptist church, was to conduct the service. Burial was to be in Riverdale cemetery. Eva P. Culpepper, Dau, F, 12, S, GA/AL/AL. Both 1870 and 1880 censuses in Lee Co., AL show Jesse's name as Tony. Jessee Culpepper, Boarder, M, Wh, Mar 1869, 31, md-9yrs, GA/GA/GA, Spinner/Cotton Mill. Eva Pearl Culpepper, Daughter, F, 3, Sng, GA/GA/GA. E-mail from Shirley Turner Garcia to Warren Culpepper, 30 Sep 2002. Robert L. Culpepper and Emma Langley on 11 Jun 1892 in Muscogee Co., GA, Bk K-441. Lillie V. Culpepper, Granddaughter, F, 2/12, Sng, GA/NC/GA. E-mail written 1998 to Lew Griffin from Stan Smith. E-mail written 14 Jan 2004 to Daniel List at Rootsweb.com (e-mail address) from Diane Carrington Bradford, e-mail address. Culpepper b.1812 in MS. Sarah was the daughter of Ailsey Canzada Ainsworth b. ca.1810 S.C. and George Washington Redmond. They were part Choctaw Indian. VI- Richard M. BOND, b-1867. Arthur Culpepper, Son, M, Mar 1900, 2/12, S, GA/GA/GA. Minnie O. Culpepper, Dau, F, 1, S, GA/GA/GA. E-mail written 1999 to Lew Griffin from James Michael Culpepper. 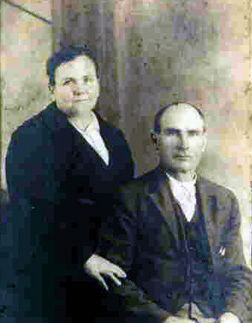 Jesse J. Culpepper and Mrs. Frances Katherine Brinkley on 16 Jul 1948 in Echols Co., GA, Book 3-74 (J. W. Culpepper was a witness). Edward Bernardo Culpepper, b. 18 Apr 1884, White, , Lee Co., FL. James I. Culpepper, Son, M, 1, S, GA/GA/GA. Obituary of Lela C. Ogden, published Sat, Apr 5, 1958 in an unknown newspaper. Obituary* 14 May 1997� Golden, Miss. -- Mrs. Eula Mae Collier 85, wife of the late Thomas Collier died Sunday, May 11, 1997, at Red Bay Hospital, Red Bay, Ala. The funeral was at 3 p.m. Tuesday, May 13, at Deaton Funeral Hume, Red Bay, with the Revs. Bobby Newman, Eddie Collier and Robert Moody officiating. Burial was in Mount Zion Cemetery. Mrs. Collier, a native of Georgia, retired from Bates Cake Shop, Augusta, after 20 years. She was a member of Red Bay Church of God and Banner Homemakers Club. 25 Sep 1938. Page 15A. Divorce Verdicts. Paul S. Culpepper vs. Edna Stephens, Augusta, GA.
24 Mar 1945. Page 3A. Divorce Verdicts. Paul S. Culpepper vs. Elizabeth Young, Augusta, GA.
Paul S Culpepper, White, Married, born 1914 in Georgia, residing in Richmond Co., Georgia, enlisted as a Private in the US Army on 26 Apr 1945 in Fort McPherson, Georgia. 23 Jul 1997, page 10C. Obituary. Mr. Terry D. Culpepper, of Atlanta, died 22 Jul 1997. Interred 24 Jul 1997 at Shiloh Cemetery at Pigeon Forge, TN. Survivors include his wife, Wanda Huskey Culpepper; a son, Terrell Culpepper of Sommerville, AL, a daughter, Teresa Vigil of Marietta; his parents, Paul and Edna Culpepper; and three grandchildren. Terry D. Culpepper, d. 22 Jul 1997 at 61 years in DeKalb Co., GA; Res. in DeKalb Co., GA, 030110. 15 Jun 2000, Page 12C. Obituary. Paul S. Culpepper, 86, of Augusta, died 13 Jun 2000. Interment 16 Jun 2000 at Hillcrest Memorial Park Cemetery. A native of Lake Park, GA, he was an insurance agent for 57 years and an Army veteran of WW-II. Survivors include his wife, Edna Stevens Culpepper; two brothers, F. J. Culpepper and Phillip E. Culpepper, both of Augusta; a sister, Dorothy McMahan of Knoxville, TN; two grandchildren and four great-grandchildren. James F Culpepper Sr., White, Married, born 1918 in Florida, residing in Richmond Co., Georgia, enlisted as a Private in the US Army on 23 Aug 1944 in Fort McPherson, Georgia. E-mail written 2001 to Warren L. Culpepper from Jesse Boone. Hattie E. Culpepper and William F. Boone on 26 Jul 1914 in Echols Co., GA, Book 1-219.
i. GLADYS MAE5 WESTBERRY, b. April 16, 1912, Georgia; d.
Ruthie Culpepper and O. T. Kinsey on 22 Jul 1920 in Lowndes Co., GA, Book H-312. Oscar T. Kinsey died 15 Oct 1982 at 83 years in Echols Co., GA; Residence in Echols Co., GA.
Ruth M. Kinsey died 8 Aug 1985 at 81 years in Echols Co., GA; Residence in Echols Co., GA, #029864.